This adventure is made possible by the 2013 opening of a land border for foreigners at the Mae Sot/Mywaddy border. We are excited to offer this bike tour that will take you through untouristy parts of Thailand and Burma and give you an authentic insight into both cultures. The tour starts in Thailand's bustling capital of Bangkok where a sunset ride introduces us to the landmarks of the capital. From here we head north to the historical park of Ayutthaya, which was sacked by the Burmese. We continue on quiet roads through rural Thailand to Uthai Thani and the old fortress of Kamphaeng Phet. One of the longest cycling days, we have is along dirt and sealed roads to the waterfalls of Lan Sang National Park. At Mae Sot, we cross into Burma and have our only significant climb of the tour as we ride up and over to Kawkareik. We spend two nights in Hpa An so we can explore the picturesque countryside filled with caves, springs and temples. A flat and easy ride takes us to Mawlamyine, made famous by both Rudyard Kipling and George Orwell. After a visit to the world's largest gigantic reclining Buddha we ride through rural countryside truly off any path. We meet up with local pilgrims as we join them for a visit to the stunning Golden Rock. Our next stop is Bago with more impressive pagodas before we arrive in Yangon for our last destination and iconic Shwedagon Paya. What an adventure through two countries that are guaranteed to capture your imagination and heart! We meet at our hotel in Bangkok for a trip briefing and cycle through many of city's famous attractions at sunset. We finish off the evening with dinner. Today we start riding from the historical city of Ayutthaya, through the ruins stupas and chedis, following the Chao Phraya River north on to Uthai Thani. 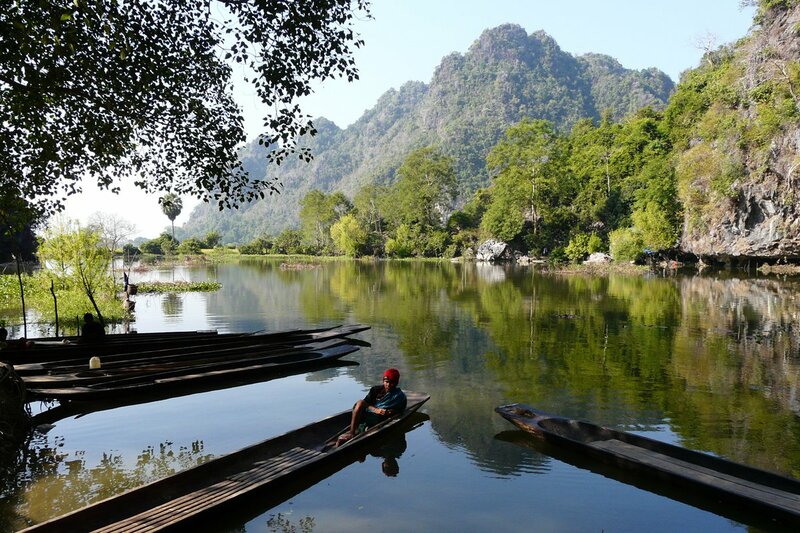 We have a long ride through mountainous and rural landscapes to Lan Sang National Park. Our route is scenic on a mixture of dirt and tarmac back roads. We start along rural back and dirt route where our support van can't follow for 14 km. A short break is made at Baan Pang Sang then continue another cycling before transferring to and check into our overnight hotel in Mae Sot. You are optional to take 20 km ride to the outskirts of Mae Sot or afternoon off for your relaxing massage or wander the border town. 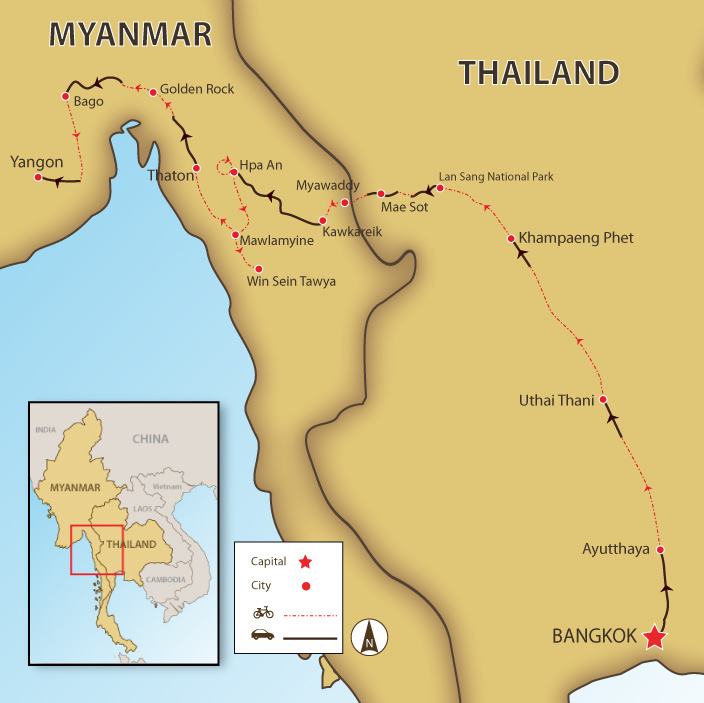 We cross into Burma today. Get ready for a tough and adventurous ride as we will be cycling on a hilly road that turns to dirt in sections. We coast downhill to and transfer in the van to Hpa An. An amazing day spent exploring the caves, temples and springs around Hpa An. You will be wowed! Our route takes us along a very flat road to Mawlamyine, the former British Capital of Lower Burma. Today we cycle to Win Sein Tawya to see the world's largest reclining Buddha. Back in Mawlamyine we watch the sunset from Kyaik Tan Lan Pagoda. We are definitely going off the beaten track today and some of the ride will be off road. We'll ride through rubber plantations, over wooden bridges and through small villages. After breakfast, we take a transfer to avoid a main road and start cycling on a small country road through a series of quiet villages with the only significant climb being at the end of the day as we approach the town of Kinpun, ‘basecamp’ for visiting the Golden Rock. We rise early for a ride in a local, open-air truck along a winding road to see the 'Golden Rock' covered by over 60 tons of gold leaf. Our ride today is to the temple-studded town of Bago. This morning we'll ride to see some of the many temples that are scattered around Bago then we make our way to Yangon. Once we have arrived we visit the famous Shwedagon Pagoda before having our farewell dinner. This morning you have more time to explore Yangon before lunch and our transfer to the airport. Day 1 - Arrive Bangkok Ride 15km. +53m / -66m. Bangkok to Yangon tour was a first rate adventure that was magnified by outstanding guides. We particularly enjoyed the "off road" nature of the trip that allowed us a close up look at the land and how people use it and live. Roads were generally rough but the high quality mountain bikes were appropriate for the task. Getting transported over high-traffic segments allowed more time to explore our surroundings and made our riding time more pleasant. Fabulous exposure to the culture of Myanmar that would be hard to get any other way than on-the-ground with a support team that SpiceRoads provided. The food in Thailand was excellent! Fantastic guides led us through the exotic countryside of northern Thailand and from Bangkok to Yangon. Win, Nai, and Thien provided us with historical commentary, alternative roads, exotic foods and always made sure that we were safe. We can't thank them enough for insuring we experienced an amazing trip. Mangalabar! Fantastic trip,Biking site seeing ,food,accommodation guides & back up crew & a international cycling team. You will need an adventurous spirit to join this tour as there are climbs, some dirt track routes, and roads that are not in the best condition. We ride 736 km, mostly on back lanes and quiet roads through scenic countryside, and pass many villages where you will find the locals curious, friendly, and polite. Sharing the road with ox carts, horse carriages, local cyclists, and waving children will indicate how out there we are. There is one tough uphill and some long days on the flats, so being prepared physically will make this a more enjoyable trip for you. A vehicle follows us for the entire journey, so exhausted riders can skip the tougher sections if they wish. We stop frequently to visit temples, rural scenes, and historical sites and national parks. We stay in a variety of accommodation along the way, including two nights in more basic accommodation, but all will be clean and have adequate facilities, adding to the adventure! Suitability: This trip is an adventurous bike journey and suitable for anyone who is willing to cycle up hills, have long riding days, and stay in basic guesthouses when necessary. Participants who cycle the whole distance should expect a fairly challenging ride. Biking Conditions: This tour covers 736 km in 13 cycling days, so it will be quite challenging. This trip has a variety of roads, some in quite good condition to broken tarmac roads, to cobble stones to vehicle-wide and narrow dirt trails. There is no technical riding on this trip, but there are some days with long distances. We meet at our hotel in Bangkok for a trip briefing and then head to the heart of Bangkok, Rattanakosin Island, for a short cycle through many of Bangkok's main historic attractions, stopping to visit a few and seeing others in a whole new light as the sun sets. We finish off the evening with a sumptuous Thai dinner. This morning, we drive just over an hour to the historic park of Ayutthaya, Thailand's former capital, but that governance ended abruptly in 1767 when the city was sacked by Burmese invaders. Despite the destruction, the ruins still emanate the city's prior dominance, beauty, and rich history. We explore the stately stupas and chedis that guard these grounds. We then cycle north on paved but quiet, flat roads towards Uthai Thani, famous for its natural beauty. We pass spectacular temples, follow the Chao Phraya River, and get a taste of the local life on our journey to our lakeside accommodation. We follow the river north and ride through local villages to Kok Mai Duen Ancient City. A short walk through the digs reveals evidence of structures from 2,000 years ago. Unearthed were tools and stoneware, including Roman-style lanterns, evidence of the flourishing trade between the East and the West centuries ago. As we continue riding, look out for water buffaloes wallowing in puddles and for ducks taking a dip in rice fields. After lunch, we take a drive to explore more of Thailand's cultural treasures at Kamphaeng Phet, commonly known as the Diamond-Walled City, which served as a military fortress defending the former capital Sukhothai during the 14th century from attacks by Burma. We take a ride within the city walls and the old fortification of Kamphaeng Phet Historical Park, absorbing the history of this UNESCO World Heritage Site. Our day begins early as we have a long ride ahead of us, making our way through mountainous and rural landscapes to Lan Sang National Park. Our route is on a mixture of dirt and tarmac, mainly flat roads through tapioca, corn, and rice fields and small villages where smiling kids greet us. After a picnic lunch, we continue to Lan Sang National Park, a rugged, granite-peaked area with several beautiful waterfalls. We take a refreshing swim in Lan Lieng Ma Waterfall before continuing by vehicle to our rustic, charming hotel located in an idyllic mountain setting. We wake to the sounds of the forest before we begin a varied day of cycling. We start along rural and dirt roads where we take in the fresh air and enjoy the rural countryside. Our support van can't follow us for 13 km, but we meet it for a refill of snacks and water at the village of Baan Pang San. After a rest and a wander around the village, we continue on a graded gravel road for another 12 km before we meet the main highway. We load up the bikes here and transfer to Mae Sot for lunch. After checking into our hotel, your guides can take you on an optional 20-km ride on paved roads to the outskirts of Mae Sot. Or take the afternoon off to indulge in a massage or go for a wander and explore this culturally diverse border town. There aren't many sights to see, but there is a vibrant market. Dinner is on your own tonight, and there are plenty of good Thai and western restaurants to choose from. This morning we cross into Burma! We drive to the border where our Burmese guides meet us at immigration and we say goodbye to our Thai guides. Today will be a tough ride as we climb a total of 1,000 m! We start off with a flat 20-km warm-up before the ascent begins! There will be little traffic as we cross the mountain because the trucks have been diverted to a new road, leaving our road quiet but in various states of disrepair, even deteriorating to dirt in sections, so expect the unexpected. We start descending after 15 km of climbing, with a few more small ups thrown in before we coast downhill to the town of Kawkareik. Here we transfer in the van for the just over one-hour drive to Hpa An. Nestled in the centre of some spectacular limestone ranges, it is the capital of the Karen State with a country town feel and a bustling, vibrant atmosphere full of friendly locals. An amazing day awaits us as we explore the caves and temples of Hpa An. We cycle from our hotel through scenery which is nothing short of fantastic, with karst peaks jutting out of bright green rice fields, including the impressive 722-m high Mt. Zwegabin. Arriving at Saddar Cave, we hike and boat through this enormous cavern that houses a reclining Buddha, and its natural formations are equally impressive. Exiting at a sublime lake, we boat through another cave to reach our bikes. We break for lunch at a local restaurant and continue to a natural spring where we can join the locals for a refreshing dip. We return to the hotel for a rest, and in the early evening, we transfer to Kaw Gun Cave, also known as the Cave of 10,000 Buddhas. The cave is covered in Buddha images of various sizes, with the oldest dating back to the 7th century. On our return to Hpa An, we stop to witness hundreds of bats exiting their cave at sunset – an amazing natural phenomenon. Our destination today is Mawlamyine, the former British capital of lower Burma, visited and written about by Rudyard Kipling in 1889. Our route takes us along very flat roads with very little traffic, passing the magnificent karst formations this area is renowned for. The highlight of today will be a dirt section of cycling on a village road to the ornate monastery of Kawnhat. Here we take a break and explore the beautiful buildings. Cycling on, we arrive in Mawlamyine and bike through the colonial atmosphere, with the waterfront being a lively place to visit. In the mornings, fishing boats and passenger ferries keep the piers and the nearby market busy. In the evening, food stalls set up for a front row seat of the sunset over the river. There is much to explore! A relaxing pace sets the tone today, as we cycle to Win Sein Tawya to see the world's largest reclining Buddha. It's 180-m long and 30-m high, with room for an eight-storey building inside! We head back to Mawlamyine where you have some free time to explore on your own before we meet up to watch the sunset from Kyaik Tan Lan Pagoda. From here, we'll also have views across the Thanlwin River to Belu Island. This evening we experience a traditional Mon-style dinner at a local restaurant. We return to the saddle for a longer ride with a few undulations. We are definitely going off the beaten track today, and some of the ride will be off-road. We ride through rubber plantations, over wooden bridges, and through small villages where very few tourists go. This is what rural Burma is all about. We overnight at the cross-roads town of Thaton. There is, of course, a beautiful pagoda in the centre of town, but not any other sights. This evening our accommodation will be basic, but there are few options in this untouristy town. After breakfast, we transfer for 30 minutes to avoid the main road and start our cycling on a small country road. Riding through a series of quiet villages, we cross numerous bridges over water heading to the nearby sea. There will lots of small climbs throughout the day, but the only significant climb will be at the end of the day as we approach the town of Kinpun, ‘basecamp’ for visiting the Golden Rock. You'll quickly realize that this is an important religious site for locals and a pilgrimage must for devout Buddhists. We have a busy and full day today, which starts early with a 45-minute ride in a local, open-air truck along a winding road. Some steps lead up to the highly revered Golden Rock pagoda complex where worshipers chant, meditate, light candles, and rub gold-leaf squares onto the surface of the boulder to gain merit. The boulder is covered by over 60 tonnes of gold leaf and delicately balances on the edge of a cliff. Many believe that it is possible to pass a thread under the rock from one side to the other, proving that the boulder is actually hovering above the cliff on which it appears to sit. We have plenty of time for photos before we head down for a late breakfast. Our day continues on the bike, cycling through the lovely Burmese countryside through small plantations and tiny traditional villages as we head towards Bago. We take a break at the small Saung Naing Gyi Waterfall and have plenty of opportunity to interact with the locals as we stop at roadside vendors eager to sell anything from watermelons to gasoline. After lunch at a local restaurant, we transfer a busy road to the town of Bago. Our hotel overlooks the magnificent Mon-style Shwemawdaw Pagoda, with a 114-m spire, it is one of the most venerated pagodas in Burma. This morning, we ride to see some of the many temples scattered around Bago. We'll see the 55-m long reclining Buddha at Shwethalyaung Temple as well as the four-seated Buddha at Kyaik Pun Pagoda as we make our way to Yangon. The ride today will be bordered by paddy fields, so there’s plenty of opportunity to see farmers at work. As we get closer to the city, the roads begin to get congested, so we'll transfer the last section to the hotel. In the late afternoon, we make time to visit the famous Shwedagon Pagoda before having our farewell dinner. The stupa glitters from the gold leaf, diamonds, and other gems adorning it and is believed to enshrine eight hairs of the Buddha. Being part of the evening scene here will be an experience in itself! This morning, you have more time to explore Yangon before lunch and our transfer to the airport.